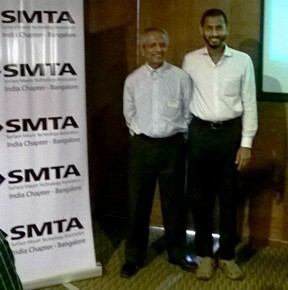 Indium Corporation Assistant Technical Manager Liyakathali Koorithodi (right) poses with Amba Prasad (left) at the SMTA India Chapter’s quarterly meeting on March 7. Indium Corporation's Liyakathali (Liya) Koorithodi, assistant technical manager, presented at the Surface Mount Technology Association (SMTA) India Chapter's quarterly meeting on March 7 in Bangalore, India. Liya's presentation, SMT Reflow Profile Optimization in the Challenging Lead-Free World, discussed new soldering challenges as a result of lead-free electronics, the complexities presented by these challenges, and how to optimize reflow profiles of different processes. Liya provides technical support for Indium Corporation's electronics assembly materials, semiconductor and advanced assembly materials, solar photovoltaic, and thermal management customers in India. He has more than 13 years of experience in electronics assembly manufacturing. Liya has a diploma in mechanical engineering from the Department of Technical Education, Government of Kerala, and is an SMTA-certified process engineer. He earned his Six Sigma Green Belt from Motorola University.